*Circuit Colors is now fully customizable. Add as many panels as you want. Single Phase, Three Phase, Black-Red-Blue, Brown-Orange-Yellow, Purple-Tan-Pink, you choose the phase colors. Single Sided panels numbered down one side. Double Sided panels with conventional "zig zag" numbering. Double sided panels numbered down the left and then the right. You choose the numbering style. For example if you are you using a high-leg system, change the B-phase color from red to orange. 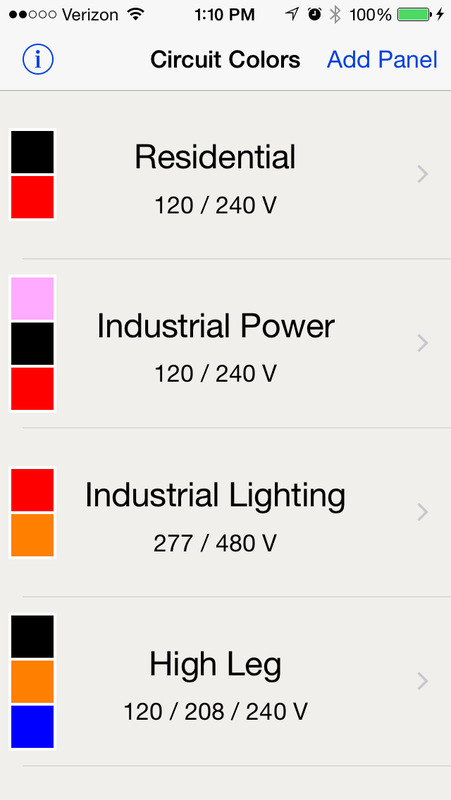 Or if you are working on a job site with it’s own proprietary color scheme, change the colors to match the job site and label it "XYZ Company, Lighting". Updated UI for cleaner look and feel.